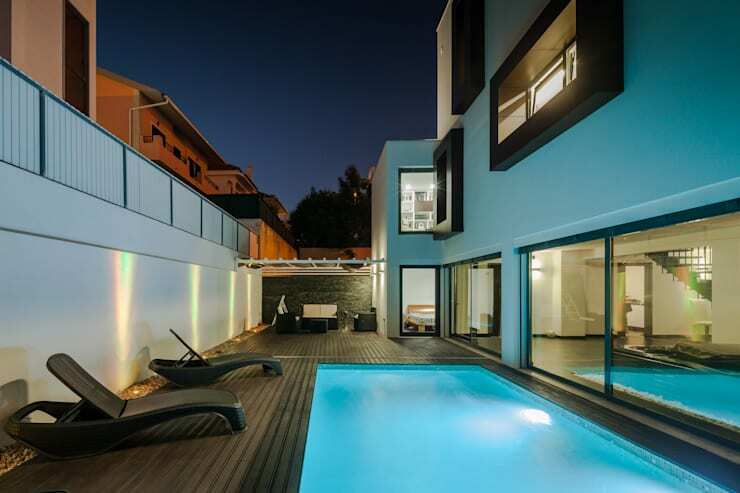 Today we take a tour to Portugal, where a modern and stylish contemporary living space awaits us. A house of excellence in architectural design and decoration. A truly classic living experience where city living meets a home that incorporates the great outdoors into the designer aspects of the interior, making the outdoor living space an extension of the home. The brilliant architectural experts at JPS Atelier—Architecture, Design and Engineering—have dedicated this amazing project to lovers of contemporary design and those who want to live close to the city and have the freedom of the outdoor space as well. 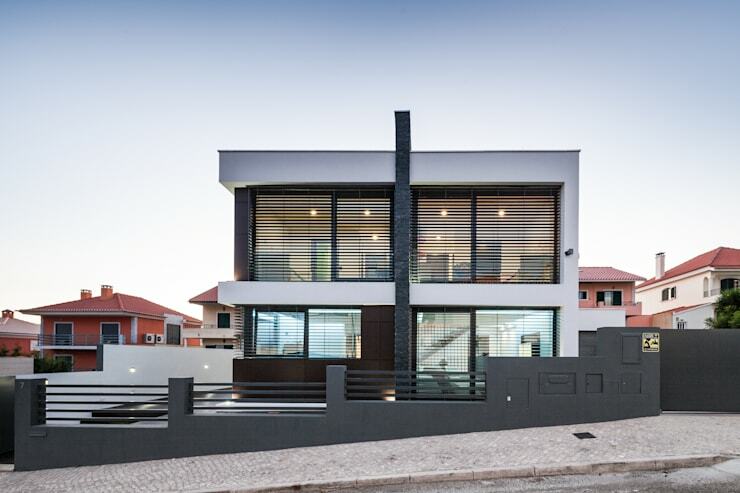 This exterior view of the marvellous modern box living area makes a perfect addition to this up and coming residential neighbourhood. The bright and airy home has excellent illuminating qualities which allows this home to be so much more stylish and contemporary, while the inclusion of a low wall around the property provides adequate street views while showing off the beauty of the residence. The neutral tones used throughout the outdoor decorative design is tasteful, classic and elegance and will remain a timeless quality to the home. The home has been perfectly positioned on the slope space of this home and allows the residence to be both eye-catching and pleasant to passersby. The box windows of this beautiful home has been elegantly framed almost accentuating the windows for effect and creating an elegant and pleasantly airy home interior that is fascinating and classic while adding an extra modern effect. While the neutral chocolate brown tone of the effective box windows, makes the home seem even more futuristic without being over the top. The idea is to break the monotony often seen in modern homes especially when in comes to neutral colour choice! There is a strong relationship between the inside and outside of this residence that allows for the special quality of this home to shine through. The floating stairs within a home creates a minimalist style to a home that is creative and elegant, while allowing the vertical movement space to match with the rest of the interior and exterior of this home. 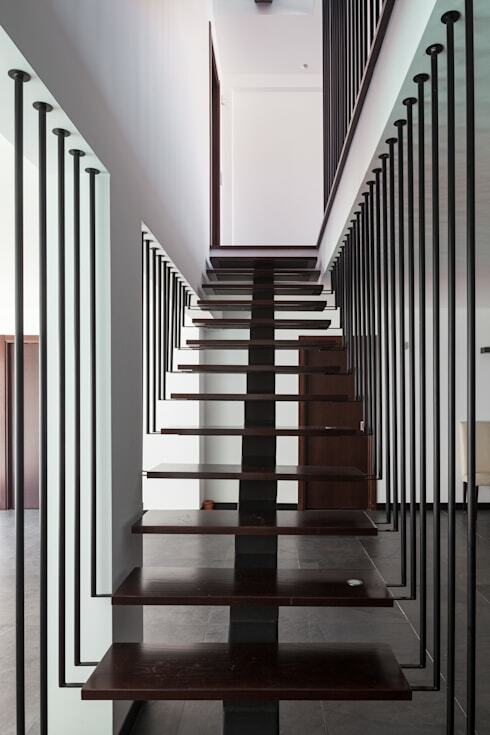 This modern stairway is also functional and has an almost sculpture like appeal to it. The home has been designed for a young family with about two children and the interior aspects and elements work well to make this space everything that is elegant and tasteful. Each aspect of this home from inside to the outside has been so perfectly placed and well thought out. This comfortable and cosy living room space has every element of elegance and charm covered with the neutral and warm tones making a classic and timeless living room area. 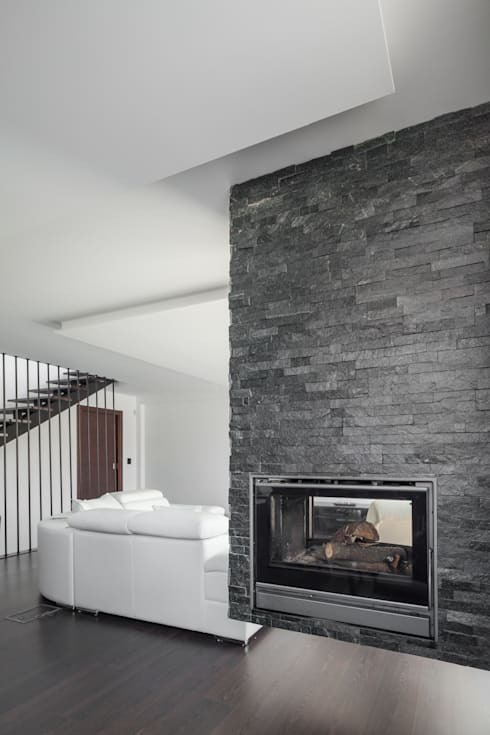 The grey brick tone above the modern fireplace makes this interior space a well adjusted area. The fireplace is perfect enough to warm up both sides of this living room area. While at the same time making an attractive addition to the home. The large white sofa adds a relaxing aspect to this home and makes you just want to sit back and enjoy the interior, this creates a strong contrast that is a warming atmosphere for this home space. 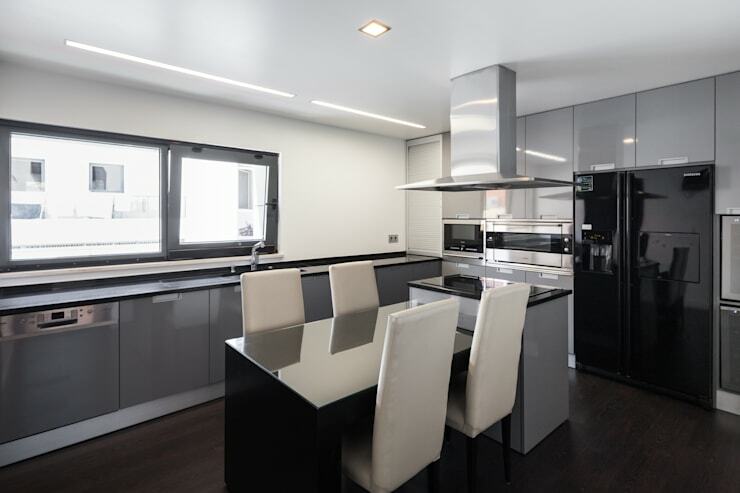 This fabulous modern kitchen may be the dream of any gourmet cook, but that doesn't mean this amazing cooking area can only be appreciated by the culinary skilled… this modern kitchen can also be enjoyed by anyone who has only mastered the skill of toasted cheese sandwiches. The simple and minimalist modern design of the kitchen makes use of neutral tones of white, grey and black to create this perfect masterpiece. And with the inclusion of an eating area within the kitchen too, this space is perfect for family life. The modern appliance and simple lines as well as cooking island means that this kitchen can be enjoyed by any guest of resident. For more kitchen inspiration, you might like to check out: What's The Right Kind Of Tile For Your Kitchen? An open and pleasantly appealing terrace area allows for the great outdoors to be enjoyed even if you are living a stones throw away from the city area. The magnificently topaz swimming pool makes the perfect addition to this outdoor living space and can be enjoyed on those hot and sticky days or those evenings when enjoying the cool water might just be perfect. The addition of an outdoor seating area makes this exterior living space more than just an outdoor area, it is now a poised social spot for those entertaining evenings when family and friends get together to enjoy a meal with some great company. Having an outdoor space such as this may just be the extra space you need for that family occasion. Have you seen a nicer pool terrace than this?